The advanced search allows more refined queries than the quick or the filter search. 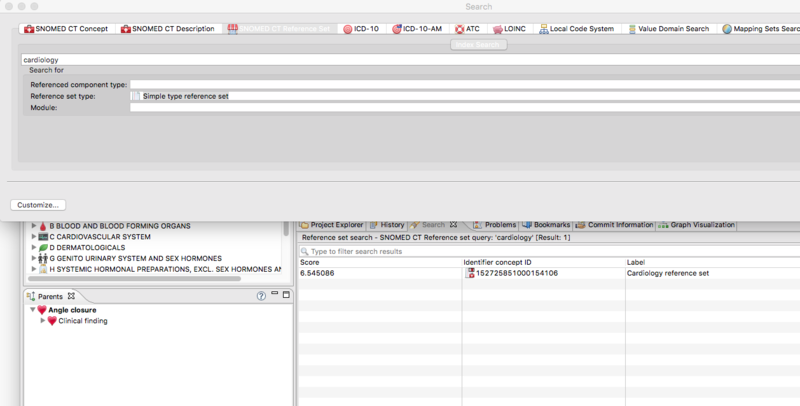 Search criteria can be specified by pre-set options in the dialog (e.g. inactive status) or with advanced query syntax (e.g. boolean operators, ESCG). Besides querying for SNOMED CT concepts, descriptions and reference sets, it's also possible to search in ATC, LOINC, ICD-10, ICD-10-AM, local code systems, value domains, files and tasks. The results are displayed in the Search view from which the respective editors can be opened. If you want to show less tabs, click on Customize and select the tabs you want to display. Check the boxes to refine your search based on Concept ID, Fully specified name, Synonym, Preferred term or use a combination of these. Use the drop down boxes to restrict the search to the concept status (active, inactive) or a particular the top-level hierarchy (e.g. Clinical finding). The search is not case sensitive. ~: fuzzy search to find similar terms. E.g. the query rofexosib~ would match the correct term Rofecoxib. ^: medication OR change^5 would rank concepts that contain the word change higher than the ones that contain the word medication. The ESCG tab can be used to execute ESCG query script. 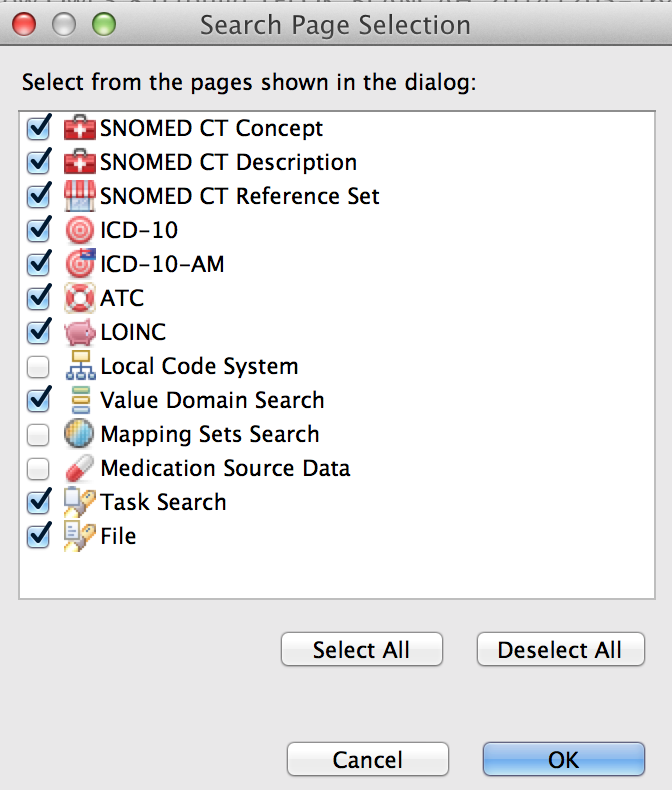 Besides SNOMED CT concepts you can also search for SNOMED CT descriptions both by description ID or term. The results are listed in the search view where they can be filtered by description type (e.g. synonym),r status (active, inactive) or module. Double-clicking on a description opens the corresponding concept in a concept editor, where the description can further be reviewed and edited. You can search for reference sets based on their Identifier Concept ID or reference set label (name of the reference set). The search can be refined by selecting their referenced component type: for example, concepts (like most of the reference sets), descriptions (like the language reference set), or reference set type (simple type, simple map, etc.). Double-clicking on any reference set listed in the search results opens the corresponding reference set editor, where the reference set can further be reviewed and edited. The results of the advanced search are listed in the search view. By default, results are sorted based on a similarity score, but you can change the sorting by clicking on the column headers. The results can be further filtered by typing text in the filter text field on the top of the view. The header of the view shows information about the query, such as the search term, number of results and execution time. Search view displaying results for "diabetes"
Show concept in concept navigator: The selected concept will be revealed and highlighted in the SNOMED CT Concepts view. Add to expression editor: This action is only enabled when there is an active ESCG editor open. Selecting it inserts the concept to the editor in ESCG syntax. Add concept to the active reference set: This action is only enabled when there is an active reference set editor open. Selecting it adds the concept to the reference set as a member. If the reference set member has other attributes to specify (e.g. map target at a simple map type reference set) this action opens a wizard where the selected concept is already inserted as a referenced component. Concepts can be dragged and dropped to the reference set editors too. For more information on reference sets please see Reference sets. Add all results to the active reference set: All the results in the result view will be added to the active reference set. This is only enabled for simple type reference sets.